Since I’ve read so much good advice, I thought I’d contribute a little myself. I’ve had the C10FSH for a couple of years now and have to say it is hands down a fantastic saw. It’s a dual bevel 10 inch slider that I bought so I could cut some boards to lay under a shed. I’ve also used it for some fine trim work and hope to use it for some furniture building. It is dead-on accurate and doesn’t need to be readjusted unless you change the blade. It has one laser, which you could set for either side of the blade. Two would be nice though. The laser is adjusted by a small knob on the side of the blade. It is really easy to adjust and sure beats having to use an allen wrench like I’ve seen on some other saws (other Hitachis included). The handle is a perpendicular handle, not the D handle and is better for right—handers since there is a safety thumb switch on the left side that you need to press before pulling the trigger. The sliding action is silky smooth with no play in the motion. The handle conformation really helps with the sliding action but is a little awkward if you’re doing non-sliding cuts. But not a deal-breaker by any means. The saw has plenty of power and has a good 5 year warranty. It’s cheaper than the other saws in the price range. And even if it weren’t, I’d still buy it. Plus, it is pre-alien style so it looks normal (although I don’t mind the Hitachi alien styling as much). A couple of things to consider though: the left side has a normal height fence. But the right side is very short, good for short pieces or laying things flat. You can purchase a right side fence but it’s really expensive ($50 right now on Amazon). 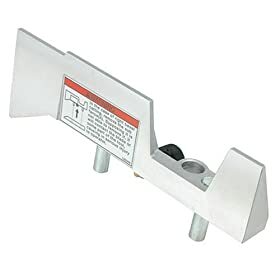 I have a Hitachi 12 inch non-slider that I was going to sell but kept for tall stock, crown molding, 4X4 posts so the lack of right side fence doesn’t irk me as much. But it may annoy others. Also, it does not have table extensions to support stock. The table on it is not bad in size. But if you have a miter saw stand, it won’t matter anyway (I highly recommend the Ridgid MS-UV as it has wheels). Last thing: There is a non-laser version you could buy (C10FSB) but it seems to usually be only about $20 cheaper. Even if you don’t think you’re going to use the laser feature, it’s worth getting it since, well, you never know. I would say buy this if you’re looking for an alternative to the Bosch, Makita and Ridgid sliders (although that’s a 12 inch). Don’t buy this if you’re looking for an alternative to Harbor Freight, GMC, Ryobi, Craftsman/Kobalt 10 inch sliders because it is definitely not cheap to purchase. I am not really a fan of Hitachi but I used this saw while building a house for my cousin, it did good with framing as well as trim. I like mine, it does everything I ask of it and does it well. Good review – thank you. I’ve always been a fan of Hitachi (except for their ugly athletic styling) and I am not surprised that this is a good machine. On my Makita, that also has a low fence, I bolt 3/8 inch boards to the fence to solve the low fence problem. I used Sycamore but any hard, straight wood would do. I have only one Hitachi item, a 20 year old 1/4 sheet orbital sander that will not die, and nothing has broken on it. I use one of these from Hitachi sub-fence on the right-side. How good is the lock, any play? Richgreer – I’ll have to try bolting the boards. Abbot – nice setup. I’ve been tempted to buy the right side fence but I’ll try Richgreer’s suggestion first. Routerisstillmyname – nice name. By lock, I’m assuming you mean locking the tubes to make it a non-slider. It works very well with no play. In fact, I usually lock it when I put it away and have forgotten once or twice to unlock it when I use it. Let’s just say it’s sturdy enough that I’ve almost knocked the saw off the miter saw stand (I don’t bolt it on the stand). I otherwise haven’t noticed any play in the locking mechanism – at least not for the one I have. THX wannabe, I mean when you move the handle to change the angle, is there a play? few saws that’s I’ve seen on display have had way too much play when you move the handle for angle cuts. Dewalt and Bosch the only saws that I’ve seen that lock /latch dead on with no play. I haven’t noticed any play when changing for either a bevel or miter angle. There are positive detents for some common angles. 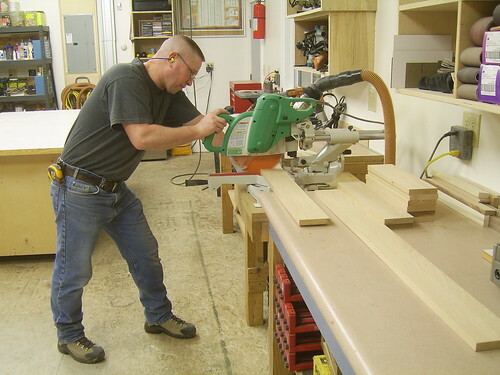 But more importantly, when you screw the handle in for the miter or bevel angle, there is no play in table movement or movement of the saw head – either with or without the slide. The handle screws in very tightly. I’ve actually forgotten a few times to unscrew it to change the angle when I store it and the thing won’t budge. It could be that my tolerance for imprecision is a lot higher than yours. I am, after all, not any sort of professional – just a homeowner who likes to work with tools. But like I said, I’ve used it for both fine and rough work, and I’ve gotten nothing but great results. If you are thinking about getting this, I would check out the reviews on Amazon as some of them are very detailed. I personally have nothing but great things to say about this saw. It is super accurate for the full length of the slide and reliable day after day. The short fence on the right has not been an issue for me. I am in the finishing business and I have had my Hitachi saw for almost 10 years now. It is a great saw for crown on the flat because it has stops for both 52 and 45 degree crown (bevel and miter) which most saws do not. Also the saw is compact and easily lugged around from job site to job site. I would go for the saw with no laser because who can trust those lasers anyways. Also the dust port actually collects most dust the saw produces where I find with the dewalt and Makita dust flies everywhere. Bottom line the Japanese make great tools. l own one myself and think its GREAT!